wind - polar plot functions - waypoint editor - SOLAS compatible - Admiralty tidal data. Charts are reproduced from raster chart data or Imray cartography. Many unique features producing remarkably easy to use navigation software. This tidal passage planning and navigation program using Neptune's established algorithms calculating course to steer, course over ground and optimised departure times all taking into account tides and tidal streams from inbuilt tidal data. 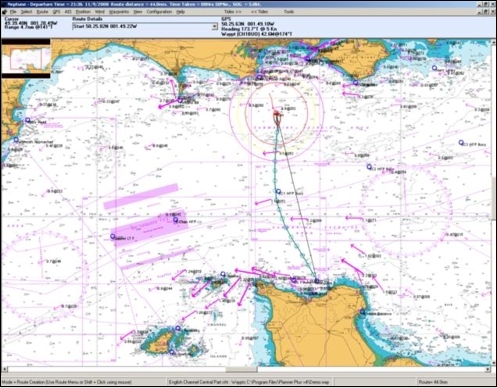 After a calculation the results are readily available on screen with the vector plot construction shown so that navigators can cross check their chartwork. Once a route has been set-up you can use the tide roll function to see the effects of different departure times on the course to steer and the effects of course over ground. Also the program allows the navigator to view the tidal conditions from 3 to 30 minute intervals in the journey. 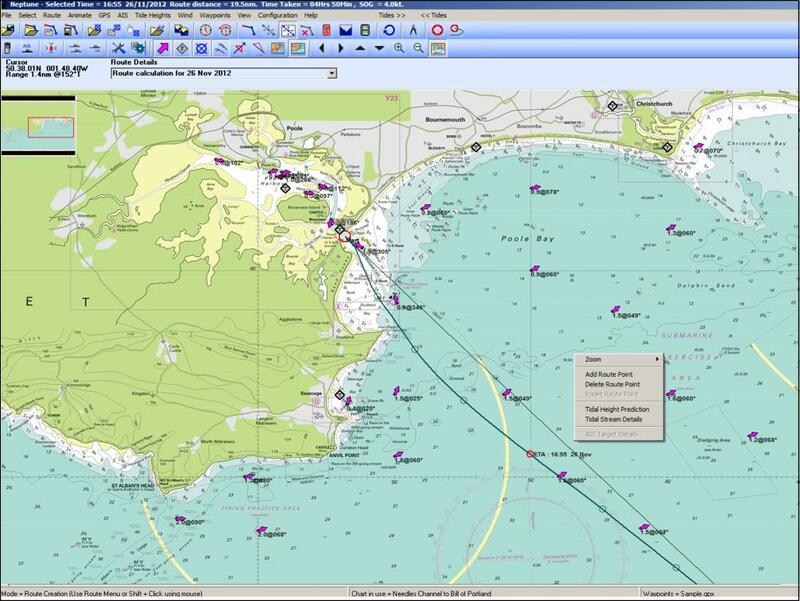 The cartography used in this software is reproduced from the raster chart data supplied by the UK Hydrographic Office this including planning, pilotage, rivers and harbours charts. The program interfaces to AIS and GPS receivers and uniquely produces a predicted track plot for the target vessel taking into account tides. Connected to a GPS the programs will act as a plotter and at the same time allow you some very flexible waypoint management between PC and GPS. If you do not connect a GPS to the PC you can plot in manual mode. Waypoint files can be created either by typing in the co-ordinates and names or by simply pointing and clicking with your mouse, you can keep & edit many waypoint files on your PC and call them up at the click of a mouse. Routes can be saved and edited on screen. If you are interested in the effects of wind, Neptune Planner PLUS allows you to overlay wind direction onto passage plans and will show your no sail area, making it instantly visible if a plan can be sailed for the prevailing conditions. Download Grib files from the internet and the wind element will be taken into account when calculating routes, so enabling prediction of boat speeds and routes to be planned with better precision. For those interested in boat performance then Polar Plots and boat speed estimation routines for the wind conditions are built into the software. The programs output is easily copied to the clipboard for pasting into the passage plan for SOLAS purposes. After any calculation where Course Over Ground (COG) is being predicted, an animate menu is visible. 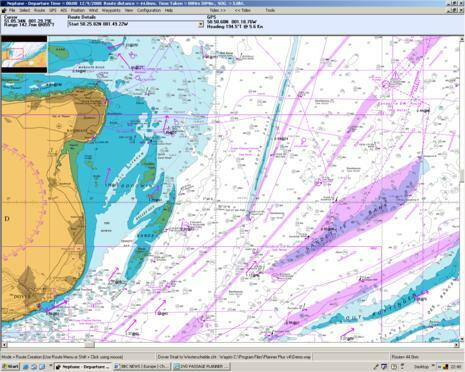 Showing the expected boat position, tidal streams and valid wind Grib file, for ever 15 minutes of your route. The program includes ports tidal height predictions displaying the daily curve, instantaneous rate of rise or fall of the tide (in metres per hour), sun rise and set times, lunar phases, springs to neaps indicator, monthly tide times and heights. You can plan into the future or re-visit last years calculations as you wish. There are many features that can be explored. The program is not time limited, and so no yearly updates are required. However the charts can be annually updated. This remarkably easy to use software is full of invaluable features for the sailor, racer, power boater, diver and fisherman.